* if your potatoes are rather moist, after mashed, let them sit in the fridge overnight, uncover. Boil the potatoes until they're cooked, immediately drain, peel, and mash them with fork, being careful to eliminate any lumps. Cool to room temp. Mix the flour, potatoes, 2 tsps fine sea salt, and the chopped herb together, add in dissolved yeast liquid, olive oil, and milk (add 80% first, decide on the rest after the dough forms). Knead until the dough smooth, soft and elastic. Set it in an oiled bowl, cover tightly with plastic wrap and let rise until doubled. Brush olive oil on a 10.5 x 15.5-inch baking pan (dark coated yields for browner crust) with 2-inch sides. Place the dough (don't knead... so as to save air bubbles inside) in the pan and gently press it out to the edges. With your hands moistened in oil, dimple the top. Cover and let rise until half-doubled. Sprinkle coarse salt and a little more olive oil over the top. At least 30 mins before you plan to bake, preheat the oven to 400F (200C). Bake until the top and the underside are golden, abt 25 mins. Ar... now I can see the tender interior of your foccacia clearer(coz the pic is bigger) ;p. Delish delish! Nonna's recipes are the best ones of all! I almost thought that i would be able to grab one by the pick. Nice one Gattina. these look delicious gattina! can imagine them dunk in olive oil. love the photo too :) wish i can be as good as u! Darling, I've been away for aweek(in bed and seek actually! )...these recipes make me feel really better! wonderful! The foccacia looks perfect! I can't get a good foccacia unless I travel a bit, the ones made here are always so dry - yours definitely does not look dry! Yum! Wow. Wow. Wow. 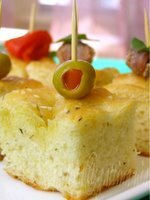 I never realised that foccacia is made out of potatoes! They definitely look moist. Oh, and i love the star shape hole on those olives. So cute. I always feel like I should be able to reach through the computer screen and grab a sample of your wonderful food! :):) I love potato focaccia and yours looks heavenly. I have never made foccasia with potato. 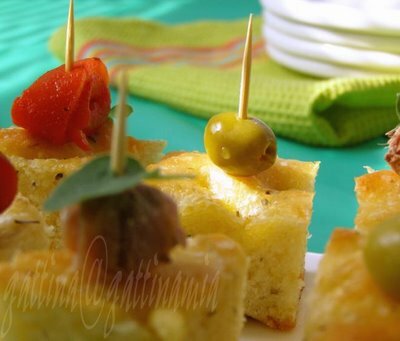 That foccacia looks absolutely amazing! I often use potatoes whenever I make bread; it gives such a lovely, chewy texture to a loaf. 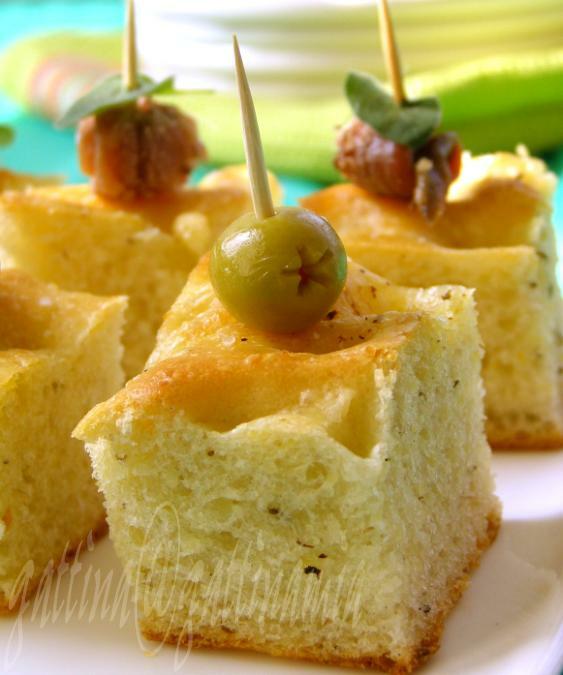 I want to pick up one of foccacia and bite into it. Beautiful pictures Gattina. Great pictures! My last foccacia turned out sad and flat, (this is what happens when you forget to add yeast... ugh). wow, this is my first encounter with potato focaccia. Thanks gattina, this is wonderful and I will be trying this sometime. I love your blog - gorgeous photos that make my mouth water and such delicious dishes too. brilynn, oh I had all types of mistakes in my early days too, hehee. Very much like this idea with the potato!